A Gentleman’s Murder just made me a believer in reincarnation. In this case of Agatha Christie in this perfectly imagined locked room mystery set in 1924. When the Inspector steals evidence from the victim’s room, Eric decides to investigate the crime along with his occultist sidekick, Avery. 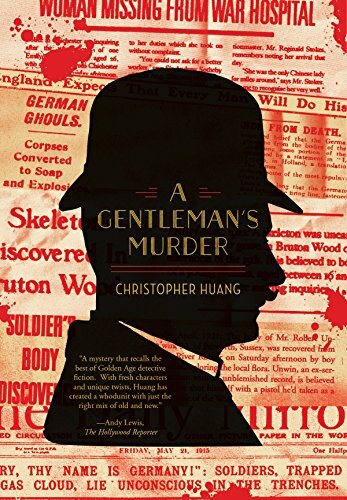 Eric’s investigation leads to the victim’s wartime service in a English hospital and a missing Chinese nurse working as a maid within the hospital. It also reveals the not so hidden racism of the time for Eric’s mixed heritage from his Chinese mother. Of course I wasn’t alive in 1924 but the setting in A Gentleman’s Murder seems pitch perfect compared to the many books I’ve read that were written back then. The mystery itself is just convoluted enough to make finding the killer a challenge but not impossible for fellow armchair detectives. It’s great fun for fans of British golden age mysteries. 5 stars! Thanks to the publisher, Inkshares, and Edelweiss+ for an advanced copy.